Synovial biomarker analysis in rheumatoid arthritis can be used to evaluate drug effect in clinical trials of novel therapeutic agents. Previous studies of synovial gene expression for these studies have mainly relied on histological methods including immunohistochemistry and in situ hybridization. To increase the reliability of mRNA measurements on small synovial tissue samples, we developed and validated real time quantitative PCR (Q-PCR) methods on biopsy specimens. RNA was isolated from synovial tissue and cDNA was prepared. Cell-based standards were prepared from mitogen-stimulated peripheral blood mononuclear cells. Real time PCR was performed using TaqMan chemistry to quantify gene expression relative to the cell-based standard. Application of the cellular standard curve method markedly reduced intra- and inter-assay variability and corrected amplification efficiency errors compared with the C(t) method. The inter-assay coefficient of variation was less than 25% over time. Q-PCR methods were validated by demonstrating increased expression of IL-1β and IL-6 expression in rheumatoid arthritis synovial samples compared with osteoarthritis synovium. Based on determinations of sampling error and coefficient of variation, twofold differences in gene expression in serial biopsies can be detected by assaying approximately six synovial tissue biopsies from 8 to 10 patients. These data indicate that Q-PCR is a reliable method for determining relative gene expression in small synovial tissue specimens. The technique can potentially be used in serial biopsy studies to provide insights into mechanism of action and therapeutic effect of new anti-inflammatory agents. The need to validate therapeutic agents in clinical trials is a key challenge in drug development for arthritis . Advances in preclinical discovery technology have identified a large portfolio of targets that can potentially be tested in patients with inflammatory arthritis. However, trials that are dependent on clinical endpoints require relatively large numbers of patients due to heterogeneity of disease and placebo responses. In addition to the substantial expense, competition for patient enrollment among the various agents also complicates the process. Alternative methods to evaluate the drug effect, to predict clinical responses, and to prioritize targets are needed. One potential solution to this problem is the use of short-term clinical trials that focus on biomarker-based analysis . This approach has been employed in rheumatoid arthritis (RA), although studies often rely on synovial fluid and peripheral blood samples [3, 4] or on semiquantitative assessments of synovial tissue protein expression  and mRNA expression . Synovial tissue analysis using immunohistochemistry (IHC) has more recently utilized precise image analysis techniques  to determine the relative expression of protein, although the lack of normalizing and external standards can potentially limit the power of this method. Analysis of tissue RNA transcripts, such as in situ hybridization, is less well established and is subject to additional constraints. To develop a reproducible and accurate method of gene expression analysis on synovial biopsies, we evaluated and validated real-time quantitative PCR (Q-PCR) on very small synovial tissue samples using a novel cell-based standard curve technique. This method is ideally suited for small proof-of-concept clinical trials designed to determine a biomarker endpoint in arthritis. In combination with IHC or tissue extract-based protein expression measurements , these techniques could help prioritize drug candidates so that resources can be focused on those patients with the greatest likelihood for success . All reagents required for reverse transcription PCR and Q-PCR were from Applied Biosystems (Foster City, CA, USA), as were the TaqMan primer/probe sets (Pre-Developed Assay Reagents; Applied Biosystems) for human tumor necrosis factor alpha (TNF-α), IL-1β, and IL-6. For human matrix metalloproteinase 1 (MMP-1) Q-PCR, a primer/probe set (forward primer, TTT CAT TTC TGT TTT CTG GCC A; reverse primer, CAT CTC TGT CGG CAA ATT CGT; probe, 6FAM-AAC TGC CAA ATC GGC TTG AAG CTG CT-TAMRA) was synthesized at Retrogen (San Diego, CA, USA). RNAStat-60 reagent for RNA isolation was supplied by TelTest (Friendswood, TX, USA). Ribo-Green, used to quantitate RNA, was obtained from Molecular Probes, Inc (Eugene, OR, USA). All other reagents were from Sigma (St Louis, MO, USA). Hip or knee synovial tissue was collected at the time of joint replacement from patients diagnosed with RA or osteoarthritis (OA), after obtaining informed consent, and was immediately placed on ice. After transporting the samples to the laboratory, fragments of the synovium (size 1–2 mm2) were excised, placed in RNAStat-60 reagent, were incubated at room temperature for 15 min, and were snap frozen in liquid nitrogen. Samples were stored for less than 5 months at -80°C until the time of RNA isolation. Blood was obtained from normal donors by venipuncture into heparin syringes and peripheral blood mononuclear cells (PBMC) were isolated using Ficoll-Paque (Amersham-Pharmacia Biotech, Uppsala, Sweden). The PBMC were cultured overnight at 5 × 106 cells/ml in the presence of 1 μg/ml Concanavalin A to induce transcription of inflammatory genes. The following day, cells were lysed in RNAStat-60. Samples were stored at -80°C. RNA from the synovium and from PBMC was isolated using the manufacturer's recommendations for RNAStat-60. Briefly, the procedure includes extraction with chloroform, precipitation of the aqueous phase with isopropanol, washing the pellet with 4 M lithium chloride followed by 75% ethanol and, finally, resuspension of the slightly dry pellet in Tris–EDTA buffer (pH 7.5). The RNA content was determined with RiboGreen (Molecular Probes), and up to 500 ng per reaction was reverse-transcribed in a final volume of 50 μl. The resulting synovial cDNA was stored at -80°C. PBMC cDNA was diluted in fourfold steps to yield a set of standards representing mRNA acquired from between 24 and 100,000 cells. mRNA levels were quantified in synovial samples by subjecting cDNA to TaqMan PCR analysis, in triplicate, using the GeneAmp 5700 Sequence Detection System (Applied Biosystems). Predeveloped sequence detection reagents specific for human TNF-α, IL-1β, and IL-6, including forward and reverse primers as well as a fluorogenic TaqMan FAM/TAMRA-labeled hybridization probe, were supplied as mixtures and were used at 0.8 μl/25 μl PCR. The forward primer, the reverse primer and the probe for MMP-1 transcript quantification were used at concentrations of 50, 300 and 100 nM, respectively. These concentrations were optimized in preliminary experiments using activated PBMC cDNA as a template. All primer/probe combinations were designed to exclude the detection of genomic DNA. To control for sample cellularity, GAPDH forward and reverse primers (0.5 μl each/reaction) and a TaqMan JOE/TAMRA-labeled probe (0.5 μl/reaction) were included in separate PCR reactions. Each 25 μl PCR reaction mix also included 1 × TaqMan universal PCR master mix with AmpliTaq Gold DNA polymerase, uracil-N-glycosylase (AmpErase), dNTPs with dUTP, and a passive reference to minimize background fluorescence fluctuations. The thermal cycle conditions were 2 min at 50°C to allow activation of uracil-N-glycosylase, 10 min at 95°C to activate the AmpliTaq polymerase, and 40 cycles of 95°C for 15 s/60°C for 1 min. The fluorescent signal at each cycle generated by the release of fluorophores (FAM or JOE) from the quencher (TAMRA) by the 5'-exonuclease activity of AmpliTaq polymerase was plotted versus the cycle number. The threshold cycle C(t), the cycle number at which an increase above background fluorescence could be reliably detected, was determined for each sample using GeneAmp software. To relate message levels for cytokines, MMP-1 and GAPDH to a known standard, fourfold dilutions of PBMC cDNA were included. The same preparation of PBMC cDNA was used in all experiments, thereby allowing comparison of Q-PCR data obtained in different runs. Standard curves were generated by linear regression using log(C(t)) versus log(cell number). The PBMC equivalent (cellular equivalents of expression [CE]) number for synovial samples was calculated from C(t) values using the PBMC standard curve. Data were expressed as the ratio between the inflammatory mediator CE and the GAPDH CE, yielding the relative expression (RE). Each PCR run also included nontemplate controls containing all reagents except cDNA. These controls generated C(t) > 40 (i.e. mRNA below the detection level) in all experiments. To compare the efficiency of the PCR reaction using plasmid and the PBMC template, serial dilutions of a human IL-6 plasmid (MGC-9215; ATCC, Manassas, VA, USA) in linearized or circular form (highest concentration, 104 copies per reaction) were run concomitantly with the regular human PBMC standards. Results are expressed as the mean ± standard error of the CE or the RE, unless otherwise indicated. The within-tissue coefficient of variation (CV) was calculated as the standard deviation expressed as a percentage of the mean value. Sample size was determined, with a power of 0.8, with a one-sided α-level of 0.05 and with a medium-high correlation (0.7), for the number of biopsies required per tissue, as well as to yield a preliminary estimate of the required number of subjects needed per treatment group. Group size calculations were based on the detection of a change in gene expression, expressed as the 'fold change' in a treated group versus a placebo control group. Differences between relative biomarker expression levels in RA and OA synovial tissues were determined by the Student t test, using log-transformed data in order to obtain homogeneity of variance. One of the primary problems encountered using PCR to quantify gene expression is that differences in amplification efficiency can markedly affect the accuracy. Each primer pair and template has a unique amplification behavior, resulting in a significant error when two amplification products are compared. To overcome this problem, we developed a reproducible standard curve method that internally corrects for differences in efficiency and reverse transcription. In vitro activated PBMC were selected because they express virtually all of the genes of interest. cDNA from activated PBMC was synthesized and serially diluted to establish standards containing cDNA from the equivalent of 24–100,000 cells. Standard curves were determined for IL-1β, IL-6, TNF-α, MMP-1, and GAPDH using TaqMan chemistry and Q-PCR as described in Materials and methods. Figure 1 shows that the stimulated PBMC are a source of mRNA for the target genes of interest. The expression of other relevant genes, including IL-4, IL-10 and IFN-γ, generated satisfactory standard curves (data not shown). The horizontal axis in Fig. 1 shows the number of cells, while the vertical axis shows the C(t) where the PCR product could be detected. Standard curve expression of IL-1β, IL-6, tumor necrosis factor alpha (TNF-α), matrix metalloproteinase 1 (MMP-1) and GAPDH. Standard curves were generated for each cytokine using quantitative PCR on activated peripheral blood mononuclear cells. The graph shows the threshold cycle, C(t), where detectable PCR product was observed, versus the template from a known number of cells. Note that the slopes of each target gene differ, reflecting different amplification efficiency. Unless the slopes are identical, the housekeeping gene cannot be used directly to normalize for RNA content. When the efficiency of the Q-PCR reaction using pure plasmid DNA (IL-6) or PBMC cDNA was compared, no significant difference was found between circular or linearized plasmid (slopes of -3.37 and -3.48, respectively). However, the efficiency using the PBMC template was considerably lower with a slope of -3.90. The magnitude of the difference in the C(t) between PBMC and the plasmid template correlated with the concentration of the template (P < 0.05), indicating that the PCR efficiencies were significantly different. The use of plasmid DNA as a standard, either for relative or absolute quantification, therefore introduces a systematic error in gene expression compared with a cell-based standard. To normalize each sample for RNA content, a control gene (GAPDH) was used. By comparing the C(t) of GAPDH in an unknown sample with the GAPDH standard curve, one can estimate the RNA content of the test sample relative to the stimulated PBMC control. This does not provide information on the absolute number of cells in the unknown sample because the GAPDH content of synovial cells might be different from that of PBMC. Nevertheless, it does offer a standard that permits one to normalize the relative RNA content in multiple specimens so that different biopsies can be directly compared. Figure 2 shows an example of real-time PCR GAPDH amplification curves using different numbers of PBMC. An example of cDNA prepared from typical synovial biopsies is also included to show that the RNA content of these tissue samples is within the appropriate range of the GAPDH standard curve. In addition to serving as a measurement of cellularity, amplification of GAPDH can also be used as an indicator of adequate RNA integrity in samples. A range of acceptable GAPDH C(t) values is selected to insure that low abundance mRNAs can be detected. We selected a C(t) of 34 for GAPDH as representing the minimum quantity of mRNA suitable for measurement. Samples with GAPDH C(t) values greater than 34 are considered inadequate for reliable measurement and were repeated with a greater amount of RNA. Cycle number versus relative fluorescence for stimulated peripheral blood mononuclear cells (PBMC) standard. Separate GAPDH amplification curves are shown for different numbers of activated PBMC. Each pair of colored lines represents replicate sample amplification plots. Circles represent amplification of a synovial biopsy to show that it is within the detection range of quantitative PCR. The dashed line indicates the threshold cycle, C(t), for this assay. 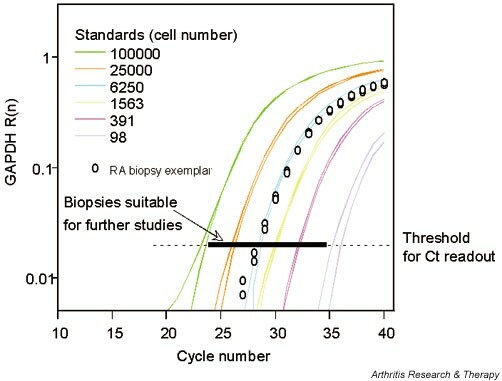 The dark bar at C(t) indicates the range of C(t) of biopsies containing sufficient mRNA for evaluation. RA, rheumatoid arthritis; R(n), normalized reporter signal. To evaluate the performance of real-time PCR quantification using both the raw C(t) measurement and the standard curve method, we examined identical data sets using the two techniques. Standard curves for GAPDH were generated by real-time PCR using cDNA from stimulated PBMC daily for five consecutive days. A known aliquot of PBMC was assayed for GAPDH on each day and either the raw C(t) was recorded or the amount was correlated to the standard curve generated on the same day. The CV was then calculated for the five separate runs. Figure 3a shows the CV for replicate assays analyzed by the standard curve or C(t) methods. The use of the standard curves substantially improved the CV, especially when cDNA from relatively low numbers of cells was assayed. The reduction in variation using the internal standard curve was even greater when assays were performed over longer periods of time. Figure 3b shows the variation in assay results over a period of 4 months with 28 separate assays. The CV of samples analyzed with the standard curve consistently yielded a CV < 25%, whereas the C(t) method resulted in a variable sample-specific CV > 60%. Coefficient of variation using PCR techniques. (a) The expression of GAPDH was used to compare assay reproducibility utilizing the standard curve and threshold cycle, C(t), methods of analysis. Five assays were performed over the course of 1 week. Note that the percentage coefficient of variation was much greater for the C(t) method compared with that for the standard curve method. (b) The expression of GAPDH was used to compare assay reproducibility utilizing the standard curve or C(t) methods of analysis. Twenty-eight separate assays were performed over 4 months. Note that the percentage coefficient of variation was greater for the C(t) method compared with that for the standard curve method. To evaluate the applicability of Q-PCR and the standard curve method to small tissue samples, RA synovial tissue lysates were prepared and divided into five aliquots for further processing. Each aliquot was individually assayed by Q-PCR using the standard curve method. The CEs were determined based on the PBMC reference standard. Table 1 presents the CEs of GAPDH, IL-1β, IL-6 and MMP-1 with the standard deviation and percentage CV obtained from the replicate experiments. The CE values are relative to the PBMC standards and do not reflect absolute expression. For instance, a CE of 1.6 for IL-1β versus a CE of 11,236 for IL-6 does not imply that more IL-6 mRNA is present relative to IL-1 in the tissue. Instead, it relates to the expression in the synovium compared with that in activated PBMC. GAPDH, IL-1β, IL-6 and matrix metalloproteinase 1 (MMP-1) expression were determined in five replicate samples that were each processed separately. Data are reported as cell equivalents of expression relative to the standard. Note: cell equivalents for different targets cannot be compared directly. The synovium is a complex tissue with regional differences in mRNA expression that can contribute to the sampling error. To determine the number of random biopsies required to reflect actual gene expression in the tissue, biopsies were collected from multiple sites of individual synovial tissue specimens. Tissue samples were similar in size to those obtained by percutaneous blind-needle biopsy (1–2 mm3). The mRNA for the target genes was readily detected in all fragments. Variation in gene expression was relatively high, in part because of differences in cellularity from site to site within each tissue (see Table 2 for the CV values). To correct for this influence, the CE values of the target genes are normalized to a reference gene using the CE for GAPDH. The RE compared with GAPDH is determined by dividing the CE of the target gene by the CE for GAPDH. As anticipated, normalization to the GAPDH content (RE) improves the precision (see Table 2). The remaining variations reflect real differences in gene expression. The REs of three individual tissue fragments from five different RA patients are shown in Fig. 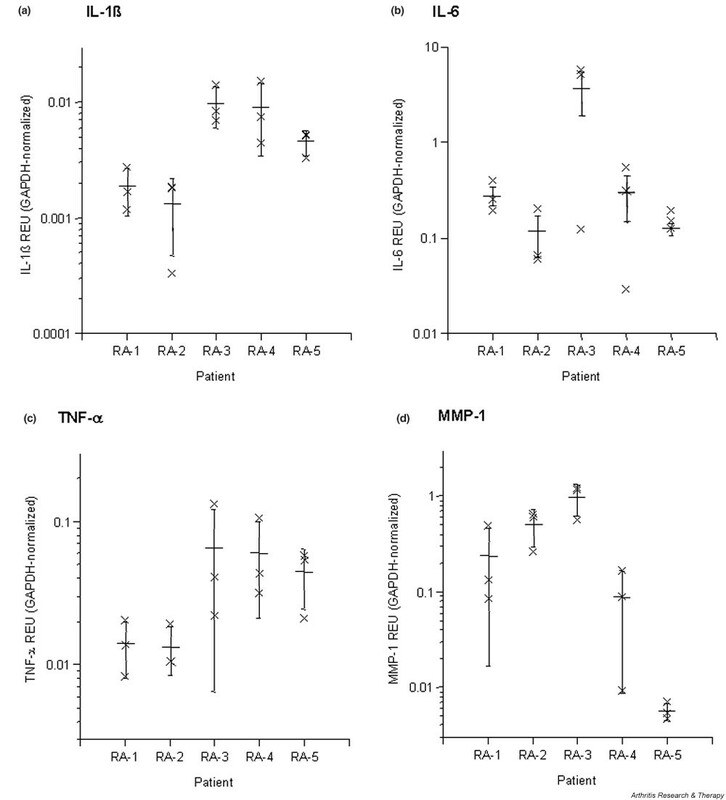 4 for the biomarkers IL-1β, IL-6, TNF-α and MMP-1. Data presented as mean ± standard error of the mean. Multiple biopsies were obtained from five rheumatoid arthritis synovial tissues and assayed for gene expression using the standard curve method. The coefficient of variation was calculated for each tissue and then the mean coefficient of variation was determined for each target gene. Data are presented as cell equivalents of expression and GAPDH normalized expression (relative expression) within each tissue. Note that for tumor necrosis factor alpha (TNF-α), matrix metalloproteinase 1 (MMP-1) and IL-1β normalization substantially reduced variation. *The number of biopsies required to limit the sample error to < 25%. Analysis of sampling error. Intrasynovial variability of (a) IL-1β, (b) IL-6, (c) tumor necrosis factor alpha (TNF-α), and (d) matrix metalloproteinase 1 (MMP-1) mRNA expression. Three biopsies each from five rheumatoid arthritis (RA) synovial tissues were analyzed by quantitative PCR using the cellular standard curve method. Results are expressed in relative expression units (REU). Data are log-transformed and the mean ± standard deviation is indicated. The CV data allow us to calculate the number of biopsies from an individual joint needed to minimize the sampling error as well as the number of patients required for a biomarker study. We used a worst-case scenario based on the highest percentage CV value of 62.7 (IL-6). Power analysis indicates that four to seven tissue fragments are required to detect a twofold change in gene expression with a 25% sampling error (see Table 2). These data were also used to estimate the number of patients required for a biomarker-based clinical trial. Detection of a twofold change in expression following treatment ranges from three patients for TNF-α to 17 patients for IL-6 using an α-level of 0.05. Detection of a threefold change requires between three and nine patients, respectively. This analysis assumes a paired (second biopsy procedure) analysis comparing the change in the treated group with the change in the placebo control. 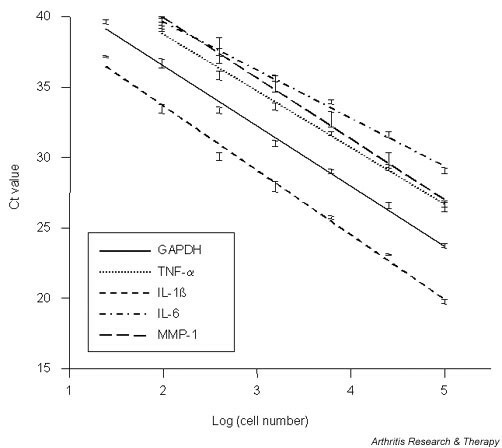 To determine whether the Q-PCR technique can detect differences in cytokine gene expression in OA and RA synovia, nine RA and 13 OA synovial tissues were sampled and assayed for IL-1β and IL-6 mRNA expression. As shown in Fig. 5, significant differences were observed for IL-1β and IL-6 using this technique. Real-time PCR using the standard curve method can therefore be successfully applied to small samples of synovium. Validation of Q-PCR in rheumatoid arthritis (RA) and osteoarthritis (OA) tissue. (a) IL-1β and (b) IL-6 expression in RA synovium. Nine RA and 13 OA synovia were biopsied at the time of joint replacement and were assayed by quantitative PCR using the cellular standard curve method. Data are expressed as relative expression units. The median is indicated and Student's t test was performed on log-transformed data. Clinical studies designed to evaluate novel therapeutic agents in arthritis have been limited by imprecise methods of assessing drug action and by limited power to show significant changes of clinical endpoints . Drug development has therefore focused on large trials with composite indices to assess efficacy . While this approach has been successful in many cases, it is expensive and many patients must be exposed to the experimental agent for prolonged periods of time. Furthermore, the complexity of the studies limits the number of agents that can be tested. Because of these issues, we have focused on the development of reliable biomarker assays that measure the expression of key mediators at the site of disease. Our studies demonstrate that real-time Q-PCR can be used on extracts of very small synovial tissue specimens that can potentially be used for small proof-of-concept clinical trials. Biomarker measurement in arthritis patients originally relied on protein analysis of fluid compartments. Blood sampling is often included in clinical trials, and measurement of certain plasma constituents, such as C-reactive protein, provides valuable information as systemic biomarkers . However, peripheral blood might not be the best reflection of disease activity and progression in RA and therefore does not necessarily correlate with clinical response . Similarly, synovial fluid can be obtained relatively easily by joint aspiration but its utility is markedly diminished by the fact that the volumes are highly variable and effusions are frequently absent after treatment with an effective agent. As an alternative, many groups have focused on assays based on gene expression in the target tissue in RA, the synovium, which is a primary source of cytokines and effector molecules. The first serial biopsy studies to assess the effect of therapeutic agents in RA used in situ hybridization to measure gene expression after treatment with corticosteroids or methotrexate . While reproducible, in situ hybridization is arduous and requires estimates of gene expression using image analysis . Quantification is improving  and radioactive detection systems have a wide linear range, but the linearity of the widely used chemical systems today is not well defined. The most common method for measuring biomarkers in the synovium is IHC. Selective expression of various proteins can be evaluated using IHC in specific regions such as the synovial lining, lymphoid aggregates, blood vessels and the sublining [16–18]. While providing excellent spatial resolution, the enzymatic detection system relies on the deposition of a pigmented precipitate. This process is not necessarily linear and can be difficult to correct without reliable internal normalization (such as GAPDH), without comparison to an independent external standard, or without an accurate method for determining the kinetics of saturation. Significant improvements in quantification have been achieved through the elegant use of computer-based image analysis, and IHC changes can correlate with clinical activity [5, 19]. One potential advantage of image analysis-based IHC is the ability to evaluate selective regions of the synovium, although unintentional bias of ascertainment is a possible risk. Validation of extract-based methods of biomarker analysis in synovial tissue will require follow-up clinical studies. One potential advantage of IHC is that the system is designed to measure protein, rather than RNA, which is more relevant to function. Nevertheless, studies to evaluate the mechanism of the drug effect would benefit greatly from complementary evaluation of specific RNA transcripts in tissue that are both reproducible and have a wide dynamic range (i.e. 105-fold differences for Q-PCR). Initial studies using PCR to quantify gene expression in serial biopsies relied on conventional PCR, which is extremely sensitive and relatively simple . However, linearity is difficult to establish and interexperimental variations make comparisons over time unreliable. Real-time PCR differs from conventional methods in that the amplified product is measured after each thermal cycle using either a TaqMan probe  or an intercalating chemical like SYBR Green  to generate a fluorescent signal. The cycle in which the fluorescence intensity of each sample exceeds a defined threshold is the C(t). For a given set of primers and template, differences in the C(t) correlate with the amount of starting template. Template loading using the C(t) methods can be normalized in cell extracts using a housekeeping gene. Accuracy of normalization based solely on differences in the C(t) requires that the amplification efficiencies of the target and housekeeping gene are identical . The limitations of the C(t) methods of Q-PCR led us to consider a set of standard curves by which the assay results could be quantified and normalized. Development of a suitable standard for Q-PCR can be problematic. Plasmids containing the target gene sequence are easy to obtain at high purity and, in theory, can accurately determine the absolute copy number. Special plasmids can be engineered with primer binding sites for multiple primer pairs yielding a single plasmid species capable of being a standard template to a family of relevant targets. However, significant problems limit the use of plasmid DNA for PCR standards. Plasmid is pure double-stranded DNA of fixed length, whereas the reverse transcriptase-PCR template isolated from tissues is single-stranded cDNA or a mRNA–cDNA hybrid with a target-specific secondary structure. These differences cause the amplification efficiencies of the standard and the target to diverge during the first critical PCR cycles when template predominates. Large differences in synovial gene expression can be detected using SYBR green technology and plasmid standards . However, each plasmid standard must be separately produced and validated. Use of multiple primed plasmid standards is further confounded by the fact that the amplification product has a different sequence and length compared with the target template. An alternative and more physiologic approach is to use a natural source of target mRNA, thereby avoiding the need to make a separate plasmid for each gene of interest while simultaneously correcting for differences in reverse transcription efficiency. While PBMC are not an intrinsically superior source of cellular mRNA, we chose these cells because they are easy to obtain and can be induced to express virtually all of the genes relevant to inflammatory synovitis . This approach also eliminates template source-based variation in PCR amplification, a significant cause of assay nonlinearity. The standard curve method does not provide absolute quantification of any particular mRNA transcript, but only provides amounts relative to the standard, similar to a standard curve in a bioassay that provides a reference unit of biological activity. The raw data derived from the Q-PCR standard curve is the CE; that is, the number of PBMC that contain the number of transcripts expressed in the unknown. This is further refined as the RE by normalizing to cellular content with GAPDH, permitting reproducible measurements over time and comparisons between samples that contain different numbers of cells. Clinical trials often require the storage of samples and repeated measurement. The present findings demonstrate that the use of a cellular standard significantly reduced assay drift expressed as the CV over several months. While the intrinsic variation in PCR assays is slightly greater than that required for a clinical laboratory analysis , the precision is sufficient to allow detection of twofold differences. Analysis of individual tissue fragments from within individual synovia demonstrated that using about six tissue samples allows for the detection of twofold differences in gene expression. Interestingly, this number is similar to previous observations derived from immunohistochemistry studies [5, 27]. Because twofold changes in gene expression can be detected in groups of 8 to 10 patients with a power of 0.8, proof-of-concept studies are ideally suited for serial synovial biopsy biomarker studies using Q-PCR in combination with protein assessments such as IHC. Validation studies are still needed to demonstrate that changes in gene expression as determined by Q-PCR correlate with clinical disease activity. Biomarker analysis of diseased tissue in proof-of-concept clinical trials can potentially be used to prioritize therapeutic targets and can correlate with clinical efficacy. Q-PCR, in particular, is a flexible, sensitive and extract-based method for measuring gene expression in target tissue. The use of a cellular standard generated with activated PBMC cDNA significantly improves assay reliability by reducing variation and by simplifying assay development. Analysis of RA synovia indicates that six or more synovial tissue fragments should be pooled to limit sampling error. Validation studies performed on surgical samples suggest that the techniques, especially in combination with protein analysis techniques such as IHC, can be applied to serial biopsy studies using 8 to 10 patients per group in which twofold differences in gene expression are relevant. The authors thank Elizabeth Duarte, PhD, for technical assistance and Dr Tanya Wolfson and Dr Karin Ernstrom for statistical analysis. This work was supported, in part, by a grant from Pharmacia, Inc. GSF and DLB have served as consultants for Pharmacia in the past.